Since the 2000s, terrestrial laser scanning, as one of the methods used to document historical edifices in protected areas, has taken on greater importance because it mitigates the difficulties associated with working on large areas and saves time while also making it possible to better understand all the particularities of the area. Through this technology, comprehensive point data (point clouds) about the surface of an object can be generated in a highly accurate three-dimensional manner. Furthermore, with the proper software this three-dimensional point cloud data can be transformed into three-dimensional rendering/mapping/modeling and quantitative orthophotographs. 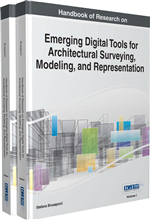 In this chapter, the study will present the results of terrestrial laser scanning and surveying which was used to obtain three-dimensional point clouds through three-dimensional survey measurements and scans of silhouettes of streets in Fatih in Historic Peninsula in Istanbul, which were then transposed into survey images and drawings. The study will also cite examples of the facade mapping using terrestrial laser scanning data in Istanbul Historic Peninsula Project. For nearly 8,000 years Istanbul’s Historic Peninsula has been home to numerous civilizations, and with its numerous mosques, churches, tombs, madrasas (theological schools for muslims), bathhouses, and Ottoman commercial buildings, the peninsula is a unique place in a world where cultures have accumulated in layers. Since 1985 four protected sites on the Historic Peninsula of Istanbul have been included on the World Heritage List, as they were recognized by UNESCO and Turkey adheres to the Convention Concerning the Protection of the World Cultural and Natural Heritage. These sites are the Sultan Ahmet Archaeological Park, Süleymaniye Mosque and its associated conservation area, Zeyrek Mosque (Pantocrator Church) and its conservation area, and the Land Walls of İstanbul. Located in the Historic Peninsula, the neighborhoods in the regions of Süleymaniye, Zeyrek and Cankurtaran, along with their traditional Turkish houses and streets that have preserved their organic forms, still reflect aspects of urban life that were typical in the Ottoman era. These neighborhoods developed in such a way that civil and social needs were met through a central mosque and its attendant burial ground, hospices (soup kitchens), markets, primary schools, madrasas, hospitals and libraries, and in this way the neighborhoods took on their particular forms. However, intensive construction brought about my rapid urbanization in the last century, together with large infrastructural works in the region and transportation projects, have had a negative impact on the world heritage sites in the Historic Peninsula and the unique silhouette of the buffer zone. In light of this situation, the government has attempted to take some preventative legal measures and efforts have been made to create properly implemented models of protection. In response to the new laws that were passed, in 2006 the Directorate of Environmental Protection of the metropolitan municipality set about drafting plans for protected sites on the Historic Peninsula and urban design projects. As a result, it came to light that work needed to be carried out to document the existing architectural and natural fabric of the Historic Peninsula if such an urban design project was to be carried out. Rectified Image: Fixed in right x, y, z coordinates produced with Nikon 70D’s digital cameras. Point cloud: Created by 3D scanners; is a set of data points in three-dimensional coordinate system which define by X, Y, and Z coordinates. World Heritage Site: A natural or man-made site, area, or structure recognized as being of outstanding international importance and therefore as deserving special protection. Sites are nominated to and designated by the World Heritage Convention (an organization of UNESCO). Traditional Wooden Architecture in Ottomans: All Ottoman era houses built in Istanbul were made of wood. There remained large quarters with traditional wooden houses among Süleymaniye and Zeyrek. Climatic, economic, cultural, social and religious features are all essential factors in building types of wooden architecture of Ottomans. Terrestrial Laser Scanning: Is a new method for surveying tasks, provide detailed and highly accurate 3D data rapidly and efficiently, which is used in Topography, Surveying, Architecture, Archaeology, Monitoring, Civil Engineering and City Modelling. Protected Sites: Cultural and natural heritage are both irreplaceable sources of life and inspiration what makes the concept of World Heritage exceptional is its universal application. The immovable cultural and natural assets in Turkey are defined as protected site and have been grouped as natural, archaeological, urban, historical and mixed. Historical Peninsula in Istanbul: Is the area which has harbored many civilizations throughout its thousands of years of history, is currently the most significant historical, touristic and commercial center of Istanbul. Historical Peninsula is surrounded by the Byzantine city walls, the Golden Horn and the Marmara Sea. Airborne Lidar: The airborne technology depends on light detection and ranging.